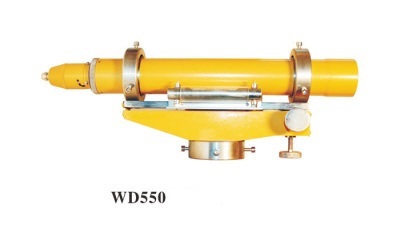 1.1 This model of equipment adopts totally collimator tubes which have the focus of 550 and been designed with plunge angle and collimation horizontal angle. 1.2 The collimator tube is equipped with a reticle with the precision 30", which can significantly improve the inspection precision. 1.6 The foundation is designed and installed with 4 leveling wheel, and at the bottom, 4 round pads can increase the ground force-carrying surface and the stability. The whole platform is available for leveling and moving. 1.8 The equipment is designed with small form factor and looks decent and charming. The total weight is 100kg and the equipment stands very firmly. The micro adjusting range of the front/back horizontal tube: 5"